When I was contacted by this client, I was told that they already had a company in mind who they had worked with previously – but if I had some spare time it would be worth throwing my name in the mix. In truth they wanted a whole package, including hosting (which I don’t do), SEO and Social Media marketing (which I don’t do) as well as an e-commerce solution fully integrated with their backend systems (this I do). I went into the meeting and explained exactly what I could do for them, and who I would recommend to do the other bits. I’m not really very good at sales – but for once my honest approach must have got their attention (either that or I’m exceptional value?). Anyway, I got the contract. The idea was to have a playful and fun website to sell what is in fact a pretty dull looking (but high quality) product – Labels Zoo were great to work for, they trusted my ideas and jumped with both feet into the playful aspects I suggested, and came up with some great ideas themselves. 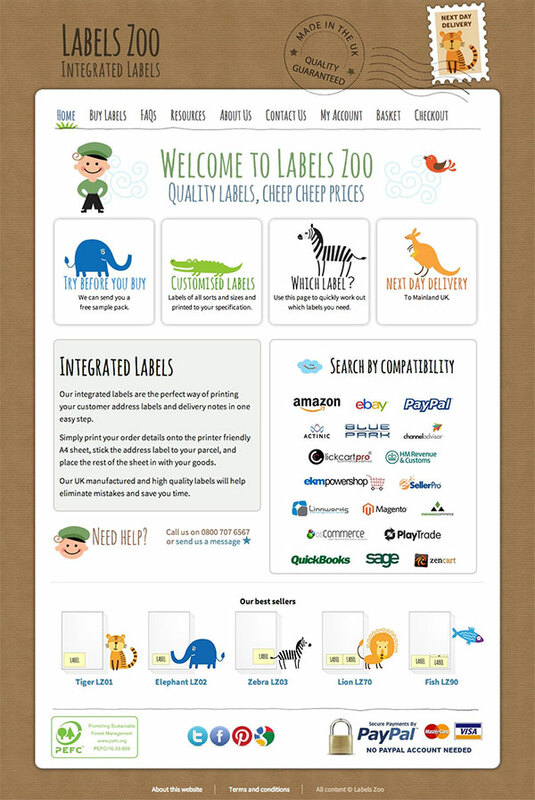 Labels Zoo was created to sell plain A4 paper with an integrated label. These are predominately used by Ecommerce companies as delivery notes. As products go, they are pretty boring with about the only difference being the number and size of label. So when we were looking for a partner to help create the website, we were looking for someone who could take a mundane product and make it exciting. We wanted a different approach to the market so we would differentiate ourselves from the competition. This is our first Ecommerce site and we wanted a safe pair of hands. We also wanted to develop it quickly and to have a partner that would put in the hours to deliver it on time. We also wanted to get an XML file out of the back of the site which we could import into are warehousing system so that we had system integration and no keying. We realised that we would also need help from a marketing company, and we felt it important that there was an established relationship between the web designer and the marketing company. Jack introduced us to the marketing company Noisy Little Monkey. The whole project was just great fun, and nothing was too much trouble. Jack came up with some great ideas and designs, and then implemented them to create a website that exceeded our expectation. He managed to turn a dull product into something exciting and we achieved our goal of clearly differentiating ourselves from the competition. The XML file was created without fuss. The way that all three companies worked together was seamless. The project was delivered on budget and on time. Since launch we have had great feed back about the site. Its fun and friendly and easy to navigate. I have no hesitation in recommending MaIago. They don’t have the overheads of larger companies, and what you get is great design, flexibility and speed.